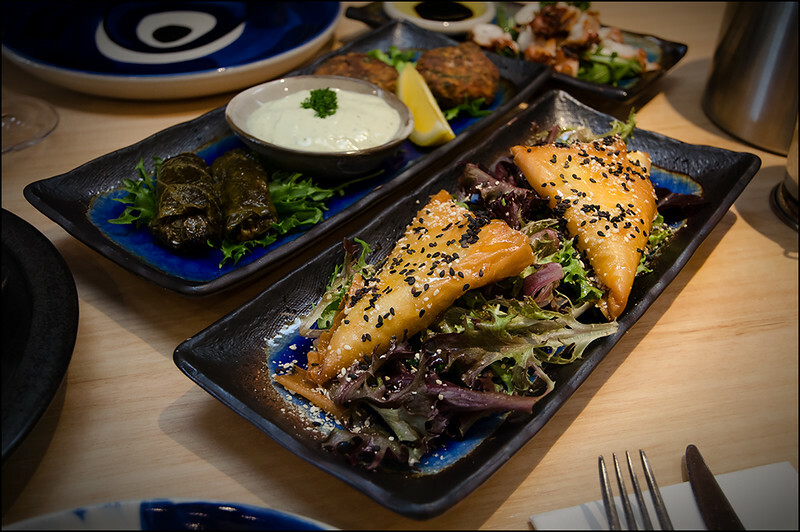 At Urban Greek – Hobart’s best Greek restaurant – you’ll be transported to the shores of sunny Crete. Read on to find out more about this unique dining experience in the heart of Hobart. Ooh…”What’s this?” I hear you say! A disclaimer? Karen and I were guests of the fantastic team at Urban Greek, yet our opinions are as honest and unbiased as ever 🙂 As we were keen to experience a broad range of menu items the serving sizes were reduced accordingly. Please keep this in mind as you salivate over the photos below, as the actual serving size in most instances is 50% larger! So often it’s only with time that the billboards and milestones of life become evident. Months or even years later; people, places, sounds, smells, coalescing and creating a little home for themselves in the grey matter; an accumulation of experiences worthy of recollection. Yet ever so rarely, when the eyes are lifted and a deep breath taken, you realise you’re actually smack bang in the middle of one of those defining moments! An unprecedented cavalcade of glorious summer days that I know we’re never going to forget. It’s also our last summer in Hobart and thus ever the (bitter) sweeter. A recent coming of age for Hobart’s dining landscape in which we have been so privileged to play a small part. And most significantly, a new direction in life for us both, and with that, a new focus. 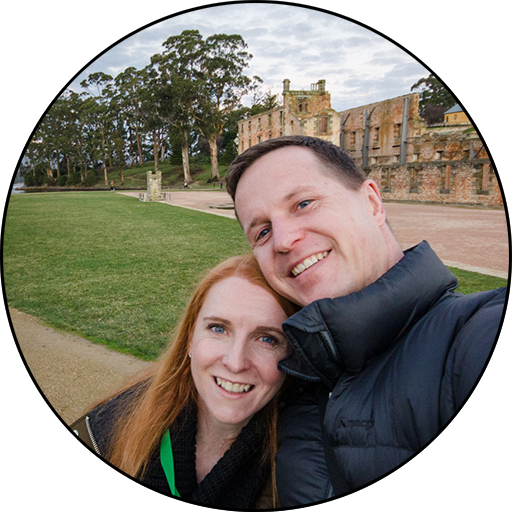 After four fantastic years of eating and blogging our way around Hobart, 2016 will see us slowly turn our gaze outwards beyond this gorgeous island, to Europe and beyond. It’s going to be an exciting, challenging and no doubt slightly scary change, but for our own well-being it is absolutely necessary and we can’t wait to share our new digital child with you all when the time is right! As we approached the Tasman Bridge, Mt Wellington in stark relief to the setting sun, a reminder of the dark side of Australian summer lingered heavily. Brown haze to the north, tendrils of smoke creeping down the Valley of Love like molasses. Again, one of those surreal moments as we stepped through the doors of Urban Greek, smoke-tainted air in our lungs swiftly replaced by the tantalising aroma of oiled, seasoned meat on a spit, hissing and spitting with every revolution! The Greek community have contributed so much to Australian society. While their rich, cultural heritage is different to my own Latvian roots, the post-WWII story remains familiar, with thousands of European migrants welcomed with open arms to make a new life for themselves on Australian shores. Unsurprisingly, the destination for most of these immigrants were the cities of Sydney, Melbourne, Brisbane and Adelaide. 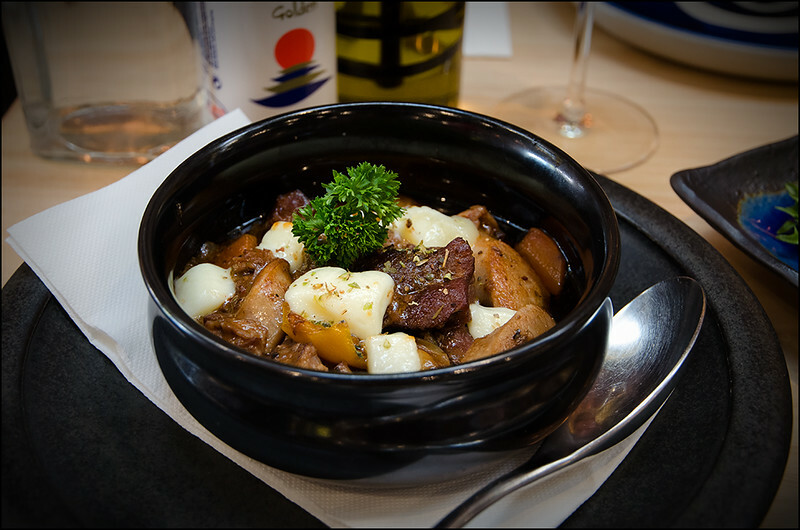 As we can attest ourselves from our childhood growing up in Adelaide, the Greek communities in those cities are strong and vibrant, and with that has come enormous exposure to the delicious Greek dishes that have been handed down from mother to daughter, and father to son over the centuries. That’s not to say there isn’t a strong Greek community, because there is, as seen in strong participation at the annual Estia Greek Festival, and in their pride for Hobart Olympia, one of Tasmania’s strongest football teams. Yet when it comes to food, this State has been sadly lacking in authentic, Greek cuisine. 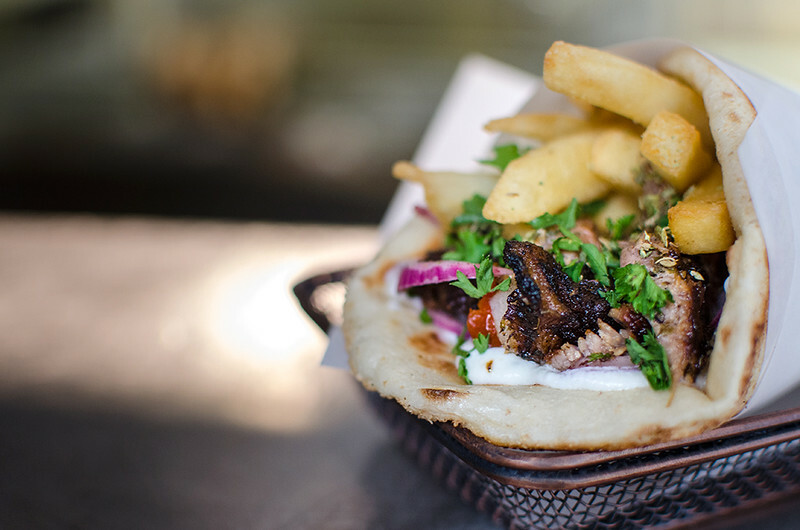 Ranging from the inevitable late-night boozy yiros at Sandy Bay’s Mykonos, to a quick souvlaki from Food Stop, to the more upmarket, yet decidedly tourist-oriented Mezethes, there’s not a lot out there. 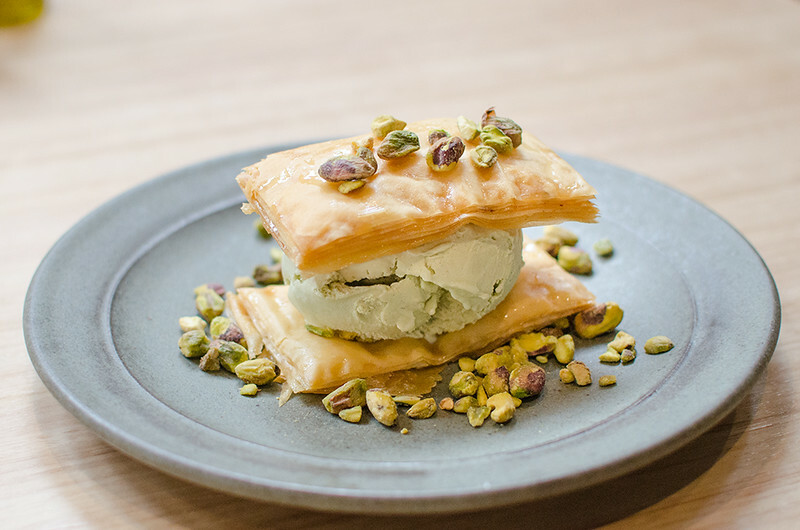 In hindsight it’s almost unfathomable that this niche has remained unfulfilled for so long, yet into the breach have stepped brothers in arms, George and Sava Kakkos, to bring Hobart and Tasmania a new perspective on Greek cuisine – Urban Greek! We say Greek, but to be precise it’s actually Cretan cuisine. As I’m sure you’ve already gathered, we’re no experts on Greek cuisine, let alone Cretan, and it would be disingenuous of us to claim otherwise. Yet while we can’t speak to the authenticity of the food, our rambling conversation with George over the space of a couple of hours spoke volumes regarding the passion of the entire Urban Greek family to introduce the folk of Hobart to Greek food with a difference. It’s a rarity in this world of social media gone mad to find a venue that doesn’t cop a gob full of criticism, jealousy fuelled invective or just general dissatisfaction. Everyone’s entitled to their opinion right? Well, Urban Greek have just about managed the impossible, and after tasting our way through more than a dozen dishes it’s easy to see why. 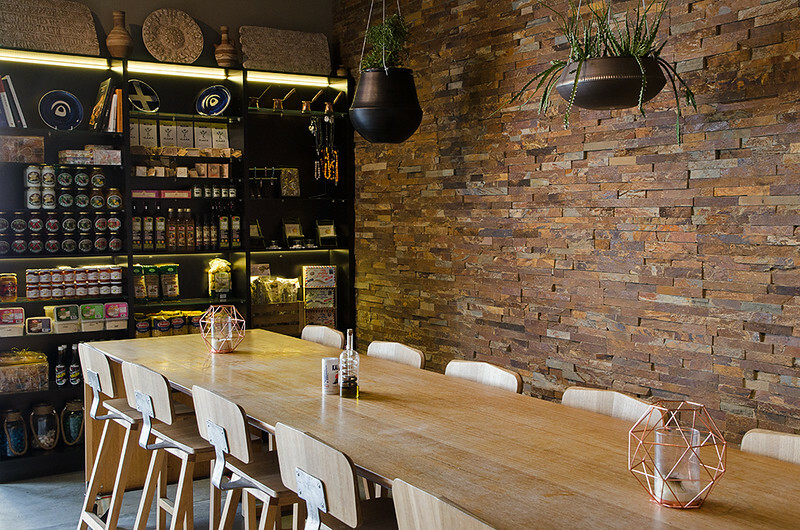 Where Templo recently delighted us with their focus on simplicity, Urban Greek presented to us a point of difference. Not just once, but time after time after time. Click here to see the Urban Greek menu. For instance, one of the first dishes we tasted was the Charcoal Octopus ($18). 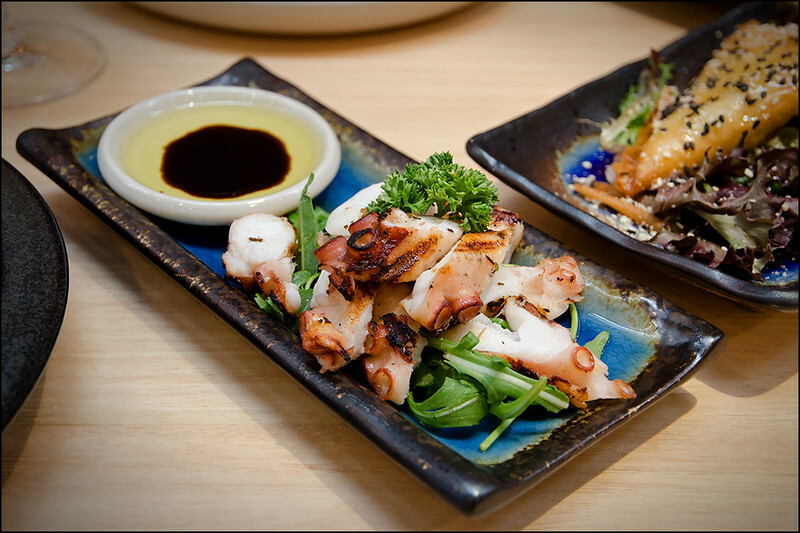 Think octopus slow grilled on charcoal, with the neat little touch of extra virgin olive oil and vinegar on the side for dipping. If you’re a South East Asian foodie, you’ve probably come across the collection of videos filmed by Mark Wiens for his Migrationology blog. When I say that I had a ‘Mark Wiens moment’ you’ll know exactly what I’m talking about! That first mouthful was a literal eye opener. It started out just like any other charcoal octopus with delicious hints of burnt char and delicately cooked meat…but then the herbs kicked in! So simple, yet adding that special touch to make the dish really stand out and be noticed. 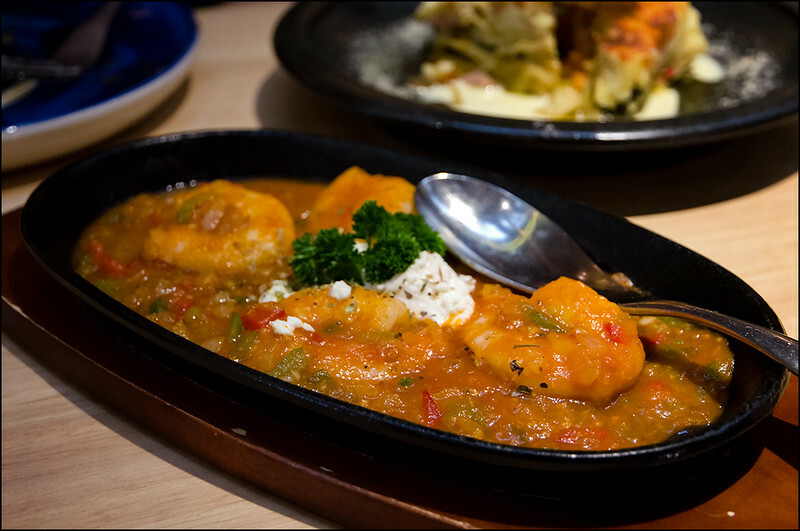 The Prawns Ouzo Saganaki (prawns simmered in homemade tomato sauce, feta cheese and ouzo – $18) were a fascinating little dish. So much theatre in their production, with flames three feet high burning off the excess liquor! The ouzo here is what makes the dish. A subtle, sweet aniseed thread, weaving its way into every mouthful, nicely complimenting the slightly acidic tomato base. 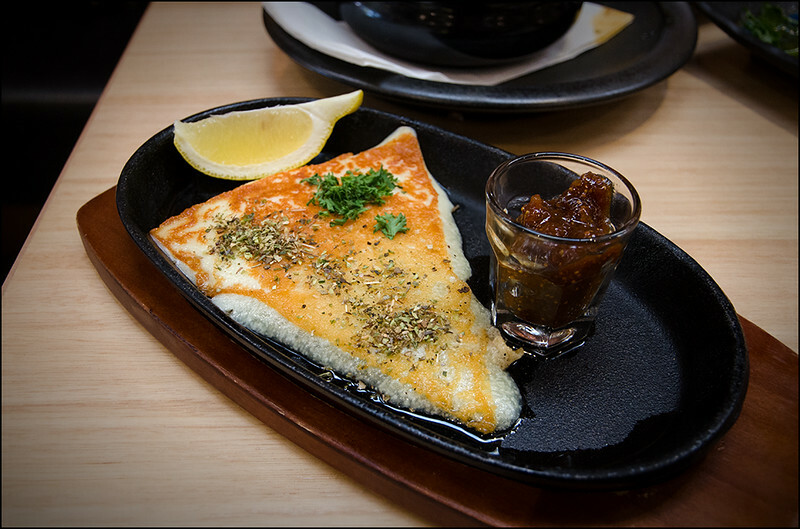 The ability of the chef to balance sweet and savoury was a standout in many dishes, with the Saganaki Cheese with Fig Sauce and Rakomelo ($13) a great example. The herb dusted and lightly grilled Kefalogravieros cheese was tasty enough on its own, but a dollop of the grappa, honey and fig jam brought multiple dimensions of flavour as good as any cheese plate, but with the extra element of heat. 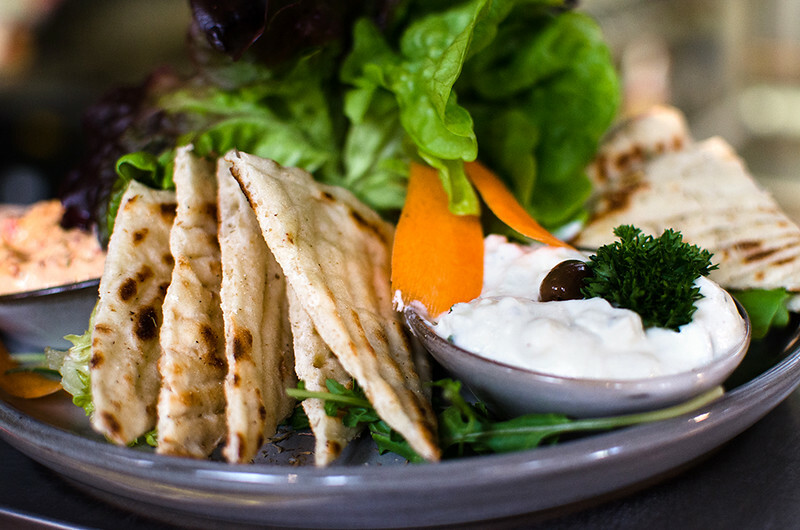 Similarly, the Enveloped Feta ($14.50) brought together fragile layers of filo wrapped around luxuriously soft feta, a sprinkling of nutty black sesame on top and lashings of sweet Cretan honey. Perhaps a little too much honey for my palate so early in the meal, but I’m sure many will disagree. 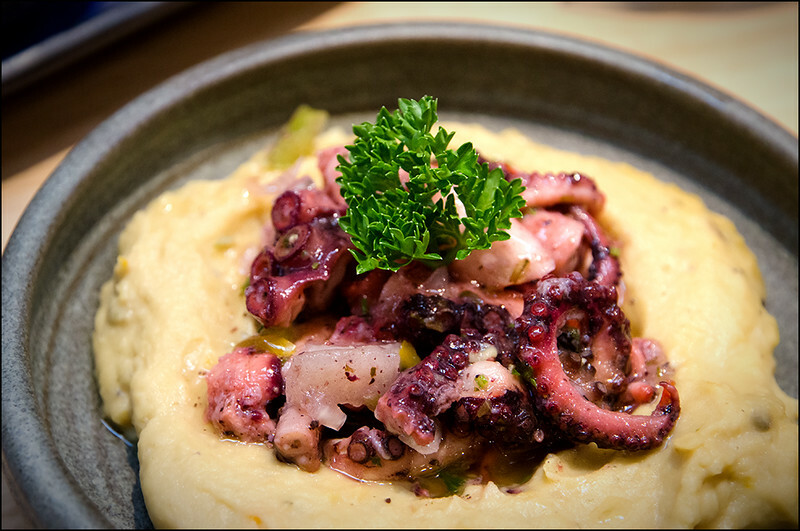 I never thought I’d see the day that I raved more about a cold split pea puree than the seafood placed on top, but the Fava and Pickled Octopus ($14.50) did exactly that. So rich, smooth and light, with a hint of salt; the ideal counterpoint to the zingy tang of the pickled octopus. 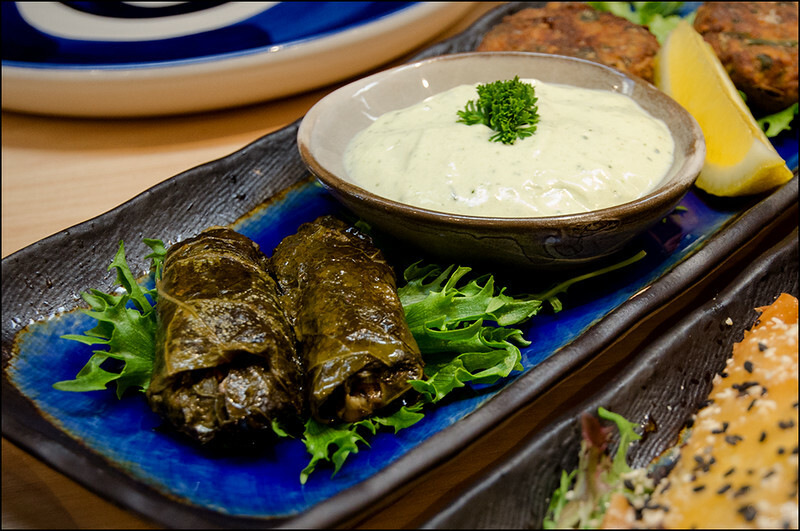 When I mention points of difference at Urban Greek, as our Dolmades and Dill Yoghurt ($9.50) arrived it was really interesting to hear George describe how they source their vine leaves from Crete itself, preferring their superior quality over the locally available alternative. 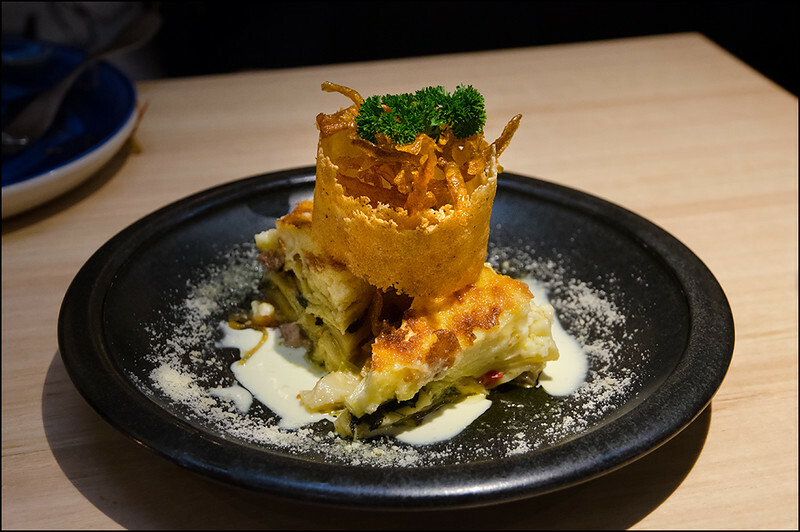 The improvement was distinct, with the leaves far more delicate and light on the palate than what we’ve previously eaten in Australia, allowing the rice, vegetable and herb filling to express itself more fully. I’m a sucker for dill (that’s my Latvian heritage right there!! ), and the dip didn’t disappoint. Those looking for a good old plate of meat, char grilled, won’t walk away wondering. With eight variations available on the menu, including lamb, pork, chicken, salmon or prawns, there’s sure to be something to suit the carnivore of the family. The lamb skewers that come with the Mixed Grill Platter ($55 for two people to share) were so good they took us back to Easter spit roasts in Adelaide with our Greek in-laws. The exterior crispy and caramelised by the grill, yet pink and tender on the inside. 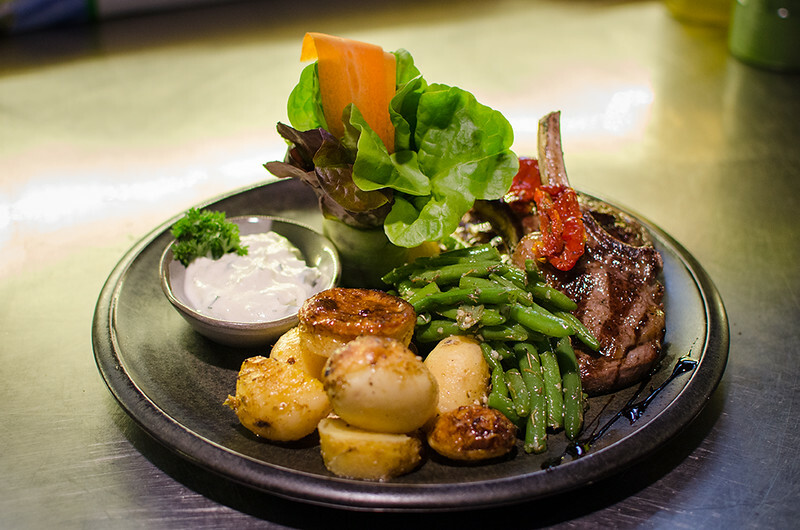 We did find the Paithakia (lamb cutlets with roast potatoes and seasonal vegetables – $29) to be a little closer to medium than we would normally prefer, but the marinade was excellent nonetheless and we couldn’t complain. The skill displayed in the Enveloped Feta should have given it away, but we were surprised to find that the desserts at Urban Greek were even better than the savouries. Ever heard of mastic? Known by some as ‘the tears of Chios‘ due to the way the resin slowly drips from the mastic trees on the island of Chios. 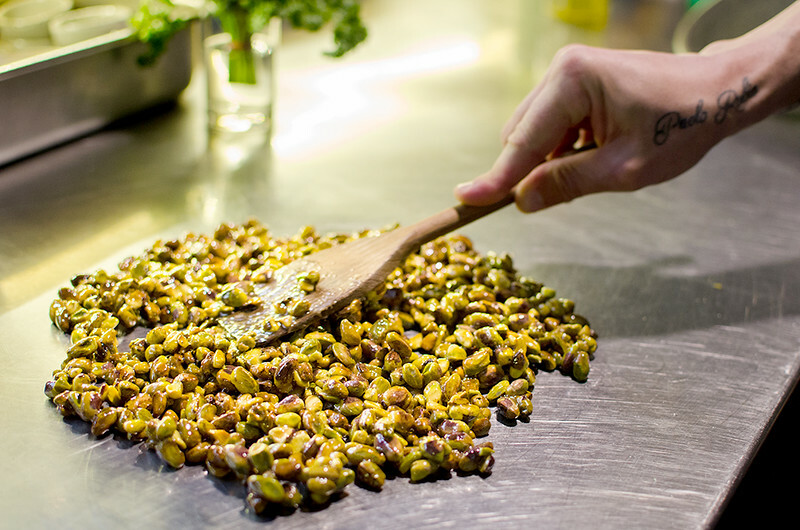 Extremely rare due to the limited number of trees that can produce the resin, in pastry chef Pavlos Zacharoudakis we are lucky enough to have one of Australia’s foremost experts in cooking with this bizarre ingredient. With hints of pine on the nose and a sweetly astringent flavour, this interesting ingredient is not only used in a gelato, but is also available as a liqueur and makes an appearance in a number of cocktails. The mastic gelato ($3.80 per scoop) is unlike anything we’ve ever tried before. 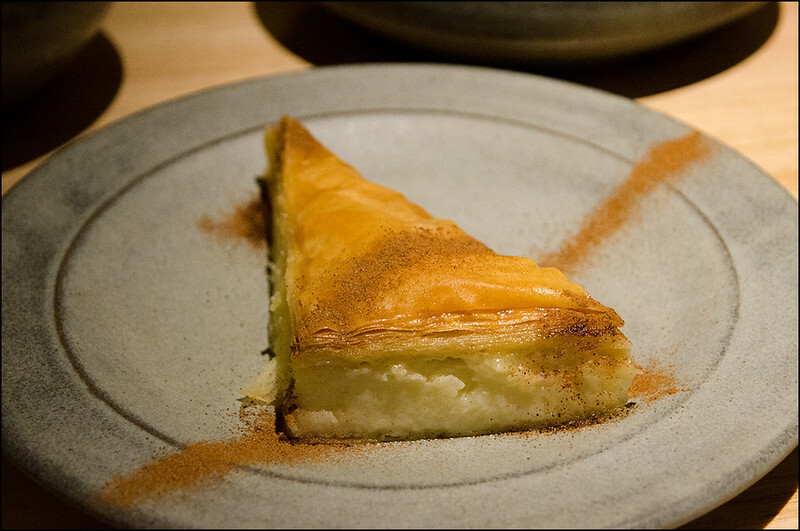 Not surprising though when when you learn that the flavour base used in this dessert was created especially for Pavlos by the manufacturer in recognition of his commitment to exploring the culinary potential of mastic. It’s unlikely that you’ll find better anywhere in Australia, if you can find it at all! Some won’t like it’s distinct, slightly chemical notes, but we found it fascinating. While not as rare, the pistachio gelato was the best we’ve had anywhere. 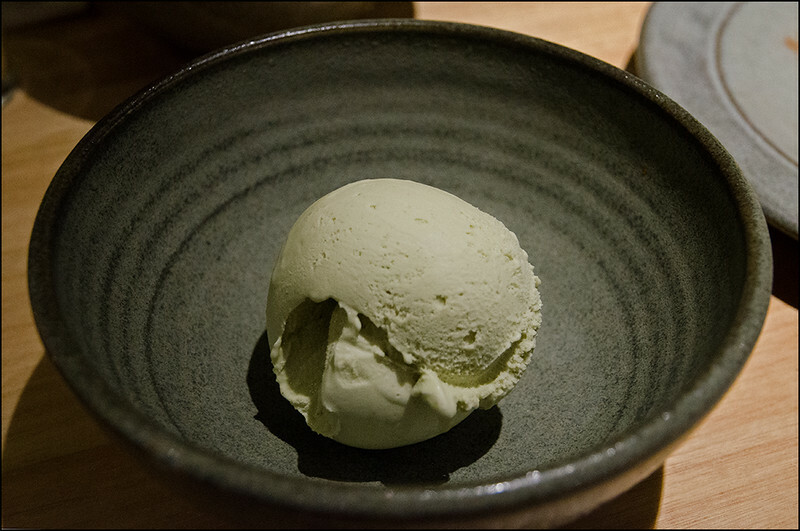 Genuinely nutty, earthy flavours evenly distributed through the supremely smooth and creamy icecream. You’d be nuts not to try it! And then there was the Galaktoboureko ($9). Wow. This takes the humble Aussie vanilla slice to a whole new realm! So light, and such subtle use of spice in both the creamy custard and the dusting across the top, it was quite simply, delicious. We’ll surely return to Urban Greek another day to try their Deconstructed Baclava ($9.50), Loukomades ($9) or Deconstructed Halva ($9.50). 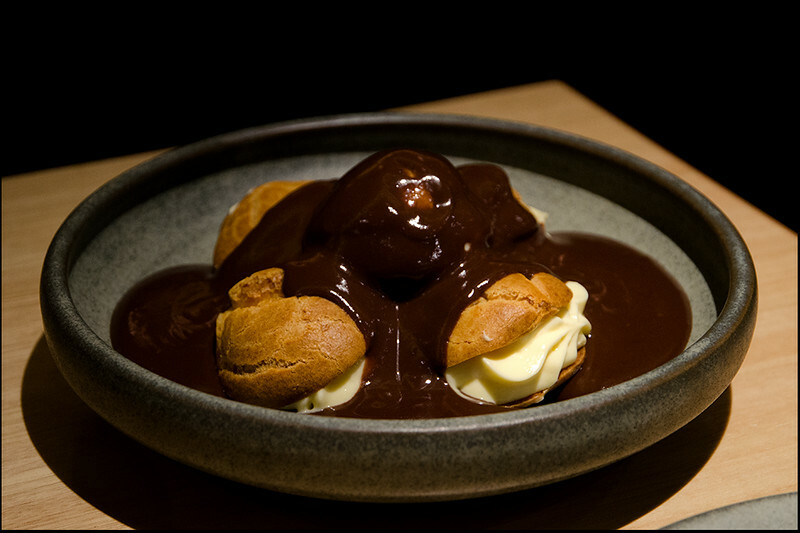 We did manage to squeeze in a couple of profiteroles before collapsing in a heap. French rather than Greek, but another fabulous exhibition of Pavlos’ sublime pastry skills. One of the great things about Urban Greek is that they are constantly mixing up their specials menu. It doesn’t matter when you visit, you can always count on a handful of extra dishes for you to try (in the unlikely event that you exhaust their extensive regular menu!). One aspect of Urban Greek that can’t go unmentioned is the excellent wine list on offer. Not only providing a great range of local and other Australian wines, George himself has curated a very interesting collection of Greek wines by the bottle. Our only previous experience in Greek wines had been a disaster, however the Boutari Moschofilero ($54) was an excellent drop, the equal of anything available locally yet with the distinction of a subtle difference in flavour, owing to the Moschofilero grape variety that we had never tried before. George mentioned that he was thinking of offering a by-the-glass option, something I’m sure would prove extremely popular. It was only as the evening had drawn to a close that we noticed that ours was one of only two tables remaining. The laughter was flowing freely from the large group of friends and family and you could see they weren’t going anywhere soon! It took us a while, but we finally put two and two together. This was the Kakkos family itself, celebrating the end of another successful week. It must be a tough life as a restaurateur. I certainly wouldn’t have the stamina, thick skin or persistence to even think of trying my hand at such a demanding profession. What the Kakkos family have realised though, as with so many of their forebears across Australia across the generations, is that having family to support and lend a hand can lighten the load, and make it just that little bit easier to get ahead in life and business alike. They’re already off to the very best of starts, and we look forward to following their future path! 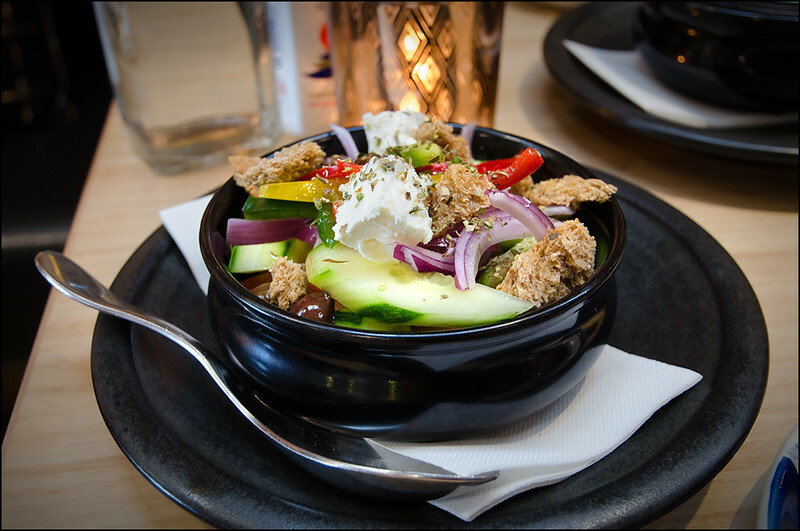 Our final thoughts on Urban Greek in Hobart? George, Sava, Vissarion (head chef) and Pavlos set out wanting to provide the city of Hobart with a new perspective on Greek cuisine; a combination of quality local produce with time-tested family recipes from Crete. 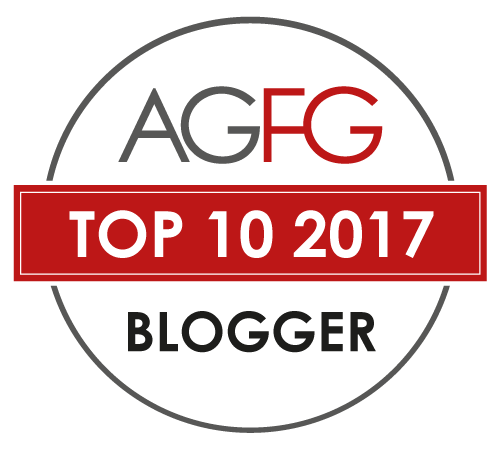 Not only have they achieved this, but they have opened our eyes to the fact that – obvious as it may be – not all Greek food is the same. Who knew that Crete was the supplier of the worlds finest and lowest acidity olive oil? Who had ever heard of such a strange dessert as mastic gelato? I can’t wait until George and the team put the finishing touches on their latest little project, offering their customers a tour of regional Greece through a handful of differing styles of authentic Greek souvlaki for takeaway! How good would that be on a cold winter’s night in Hobart? 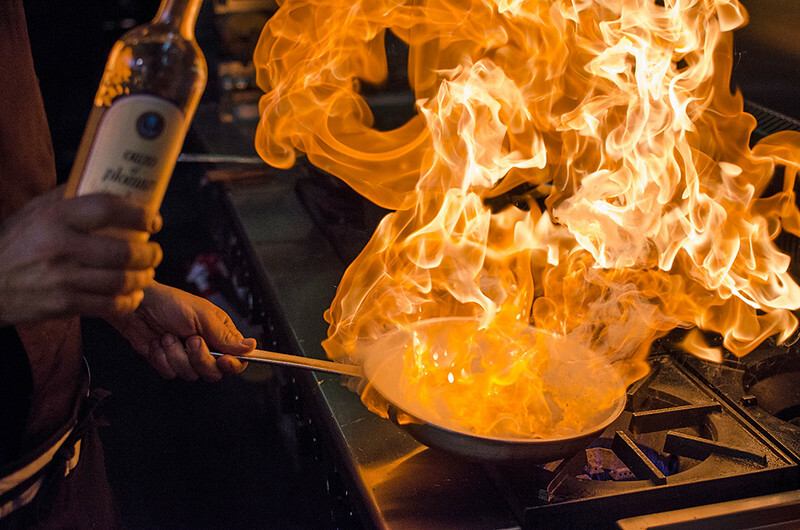 Urban Greek provided us with excellent service, a convivial and relaxing atmosphere, and fantastic food with a difference. You don’t need an adventurous palate to enjoy this style of food, and for those who care, the serving sizes are truly epic! We encourage you all to experience the hospitality of the Kakkos family and see for yourself what all the hype is about. 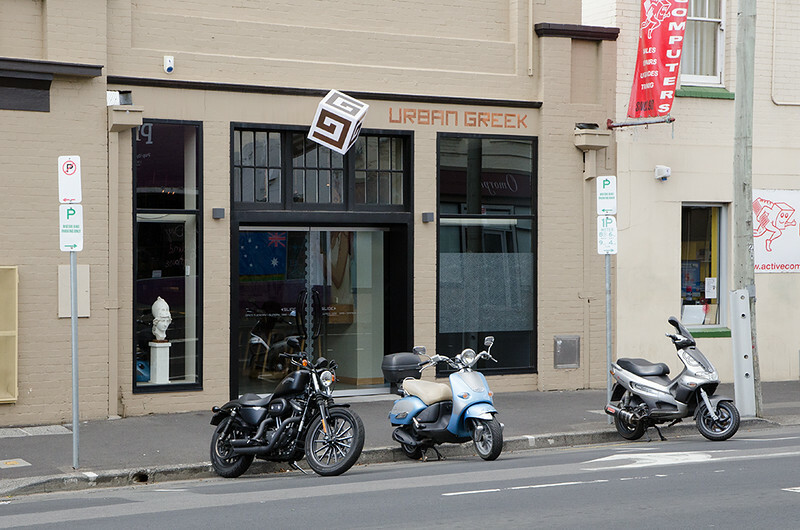 Urban Greek is located at 103 Murray Street, Hobart. Dinner: 7 days, from 5pm (last sitting is at 9:30pm). Looking for other delicious food in Hobart? Aloft – Ethically sourced, and exquisitely presented Pan-Pacific fare from one of Hobart’s finest chefs – and the views are easily the best and most romantic in Hobart. Templo – This tiny eatery has been voted in Australia’s top 100 (#45) with good reason, and their small plates will transport you to the sunny shores of the Mediterranean. Landscape Restaurant and Grill – If you’re visiting Tasmania and want to experience a truly memorable and authentically Tasmanian dining experience, then Landscape Restaurant and Grill is where you need to be. 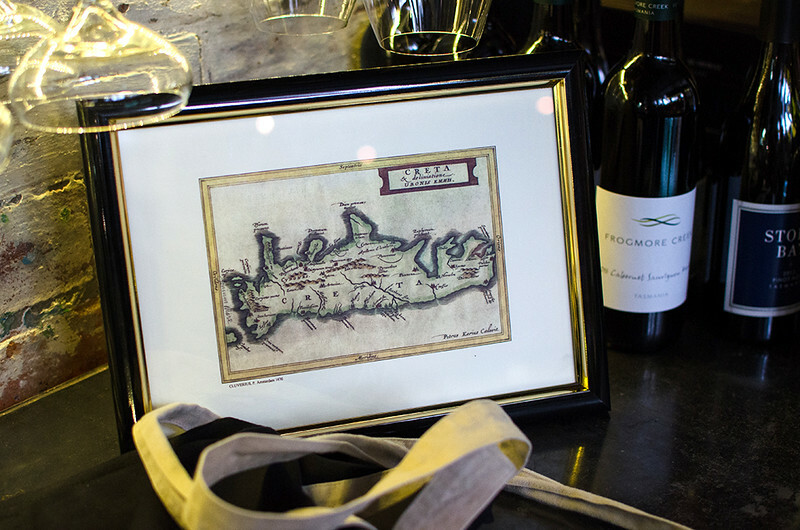 A wine list second to none, and the finest Tasmanian produce you’ll find anywhere on the island – this is an occasion you’ll never forget!